China's spacecrafts were the first to land on the moon since 1976. Weibo loves drawing fan art of them. On Saturday, China's Chang'e Number 3 became the first spacecraft to successfully land on the moon since 1976. Over the coming months, its lunar rover (named Yutu, or Jade Rabbit) will be collecting soil samples from areas previously unexplored by the U.S. and Russia. Chinese social media lauded the landing, moreso because the spacecrafts were named after beloved mythological figures. The main ship is named after Chang'e, a reluctant goddess believed to have married a heroic archer before accidentally drinking his immortality potion and floating to the moon. 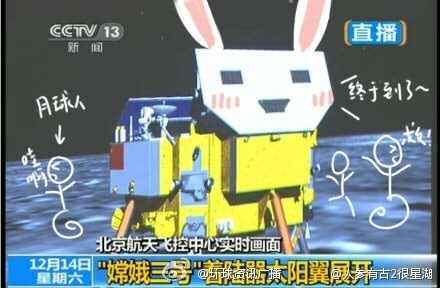 The spacecraft's rover is named after the Jade Rabbit, Chang'e's only companion in her lunar palace. Chang'e regretted her isolation on the moon, and spent her time grinding up more medicine with the Jade Rabbit. These are the first images of the two spacecrafts taking photos of each other on the moon. The goddess and the rabbit, together and alone as always. A lot of people found that poetic and oddly adorable. @毛巾被被-黑夜里的's interpretation of the spacecrafts snapping photos of each other. There were swellings of national pride. There was also this sort of nationalism. Though, as mentioned, the rover touched base in a different area than the U.S. and Russia's landing sites. Not everyone agreed on its glory. The "tea drinking" joke refers to a new Chinese law where "subversive" internet comments can mean jail time if reblogged more than 500 times. Comments like these were quickly censored online.